Gobi Manchurian/ Cauliflower Manchurian is adapted from Chinese and seasoned with Indian flavours. It is a very popular dish in India and extremely delicious with a fusion of Chinese and Indian flavours. With the Gobi season around, you get fresh Gobi in markets. It is a very healthy Vegetable with calcium, vitamins and minerals. Full of antioxidants and phytonutrients, it protects you from cancer. All said, it is another favourite vegetable of mine, and I am a great fan of all its versions; Gobi Manchurian, Chilly Gobi, Cauliflower Mappas, Aloo Gobi, Gobi 65, and Gobi Paratha being the most enjoyed. However, it is important to soak it in water with turmeric and salt for at least half an hour to one hour, to remove the effects of pesticides and other unwanted elements like bugs and worms. Rinse nicely before cooking. Gobi Manchurian can be had dry or with little gravy as per your liking. The recipe for Gobi Manchurian is semi gravy type, and if you like it dry, avoid adding water.You might also like Aloo Gobi Masala another healthy Gobi dish. Do check my other Indo-chinese recipes like Szechuan Chilli Chicken, Soya Manchurian, Honey Chilli Chicken, Chilli Pork, Chilli Fish, Chicken Manchow soup, Spring Rolls, Beef with Mushroom, Mushroom Pepper dry, Chili Paneer. and tibetan recipe for Chicken Momos. It goes well with Fried rice, Noodles, whole wheat Naan, Rotis and Pulao. This recipe is a little different as I add little carrot as well to the gravy. It adds to the flavours and makes the gravy deliicious.Please follow the tips for best results. Gobi Manchurian, Soya Manchurian and Vegetable Manchurian are great vegetarian dishes to serve during get-togethers. Serve it dry as starters and with semi gravy for dinner. 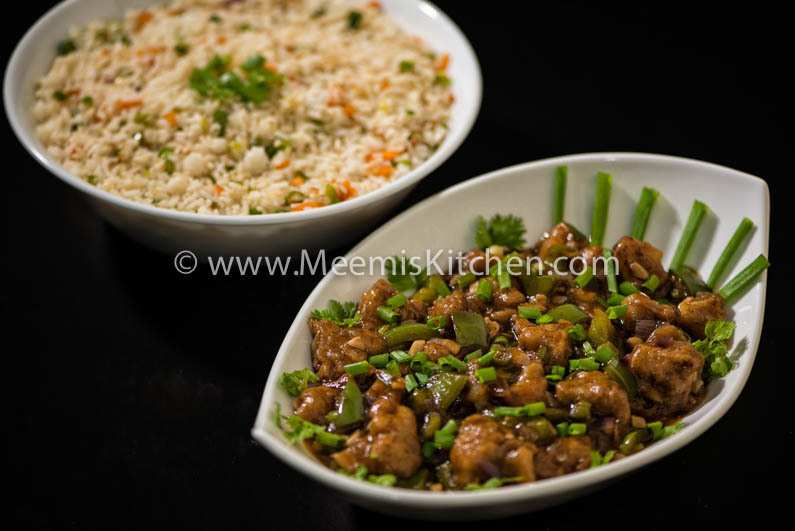 Do try this scrumptious, restaurant style Gobi Manchurian. Enjoy!! Wash and soak cauliflower florets in water with turmeric and salt for half an hour. Rinse and drain. Boil the cauliflower in boiling water with salt for three minutes and drain and keep aside. 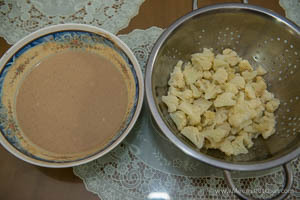 Make a medium thick batter with Maida, corn flour, pepper powder, soy sauce, ginger garlic paste, salt and water. Dip the cauliflower (bite size) florets in this batter and deep fry in oil till golden brown. Set aside. 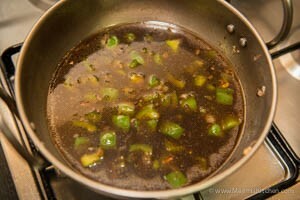 Remove excess oil from the pan, and keep enough oil for sautéing. Add the finely chopped garlic, Sauté for 1 minute, add ginger and stir fry for few seconds, add finely chopped green chili and then finely chopped onion and carrot (chop very fine). 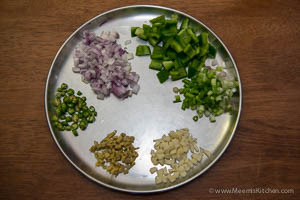 Once the onion becomes pale, add pepper powder and cubed capsicum after. Sauté for few seconds and add the soy sauce and Tomato sauce. Add water and adjust the salt. Add the chopped spring onions and celery (optional). Bring to a boil. 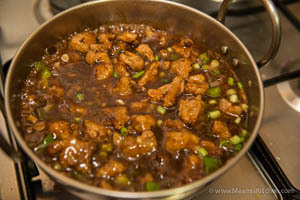 Mix 2 tsp corn flour in ¼ cup of water and mix to the gravy stirring well to thicken the gravy. Add the fried cauliflower, mix and simmer for few minutes. Serve hot. Garnish with chopped coriander leaves/ spring onion. If you like it dry, avoid the onion and water and once you add the sauces, add the fried cauliflower, spring onion and mix well. 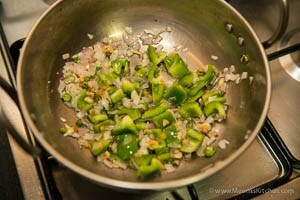 Add more green chilies or pepper if you like it more spicy. You can try adding vinegar (½ tsp) if you like it a bit more tangy. Tomato sauce adds little sweetness, so no need to add sugar. The soy sauce used is dark soy sauce, if you are using light soy sauce, add more to get the desired taste. If you need more gravy, add more water and adjust the measure of sauces and corn flour to make it a thick gravy. Cauliflower is a super food and has many compounds that fight and kill cancer cells. It is full of anti–inflammatory nutrients and reduces inflammation. It contains many minerals and vitamins. It helps brain development and improves memory and learning ability as er studies. It is a good antioxidant and helps in detoxification.